One of the most innovative products within the storage industry, providing the ability to either double storage capacity or free up valuable floor space. This system is often referred to by a variety of names including mobile storage, roller racking, movable shelving and compact storage just to name a few. If you find that a lack of floor space or archive storage is causing you and your company problems, please check out our guide to mobile shelving to see if it could transform your working environment like it has already for many others. Due to the success of our high density storage system that fits perfectly into the office environment, we now also offer some of the finest office storage within the UK too. This includes desks, seating, ergonomic workstations, pedestals and storage units from high end office furniture manufacturers like Triumph Furniture and Actiu. 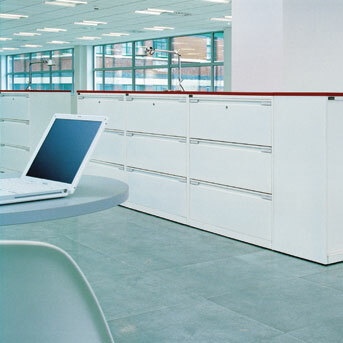 We can supply anything from a single desk to designing an entire office environment. Speak to us and see how we can design, project manage and deliver the finest office furniture solutions. Alongside our primary products like mobile shelving and office storage, we also provide the highest quality storage (workshop) products: hazardous cabinets, warehouse storage, warehouse racking and industrial ergonomic seating, workbenches and Bott storage cabinets. Storage containers are very useful for keeping small items in order and we have an extensive range including the renowned Kbins as well as stackable containers, Arca products, attached lid containers. We are also the UK’s number 1 suppler of Lloyd George Boxes that are used for the storage of medical records within the GP surgeries and hospitals throughout the NHS and Healthcare sector commonly stored on our Mobile shelving units. There are endless options when it comes to lockers, some are designed especially for schools or industrial sectors for the storage of PPE equipment, as well as designer lockers like the Lm Range from Triumph Furniture for customer facing environments that sit beautifully in any office storage environment. With the emergence of laptops and mobile phones as a staple item for most employees, we can now provide dedicated safety lockers that actually have the ability to charge the laptop or phone while secured in the locker. So rest assured no matter what type of locker you require or for what environment, from schools, offices, museums, hospital or factories, Onorin will have the perfect locker for you. Walkways and bicycle shelters are a fantastic way of protecting people from the elements and providing a dry place to store bikes, scooters, mopeds and motorbikes. The covered shelters we design and install fit perfectly into all environments and are especially popular with school and office car parks. Bike shelters provide protection and security enabling staff, pupils or the public to rest assured their bicycle is safe. If you require something bespoke then Onorin Storage can also design any shelter or walkway you require no matter how awkward the space or walkway may be. With so many dangerous things that need to be stored from fuel, chemicals, pesticides, PPE equipment, acid and toxic substances. It is extremely important that these substances are stored in the correct manner and in accordance with UK guidelines and compliant with DSEAR 2002, HS(G)51 1990, COSHH, HSE and other standards. All of our hazardous cabinets not only comply with, but surpass these guidelines and we can even modify standard models to suit you specific hazardous storage requirement. A mezzanine floor, entresol or storage platform is the perfect way to extend your existing floor space. If you have available height within your building, which could be an office, retail shop, factory for example and are running out of space and are considering moving premises or extending before you do speak to us about what options you have available regarding mezzanine flooring. We design, manufacture and install the finest quality mezzanines within the UK. If you are concerned about building regulations or fire rating then you can relax and let Onorin Storage guide you through the regulations and UK laws. 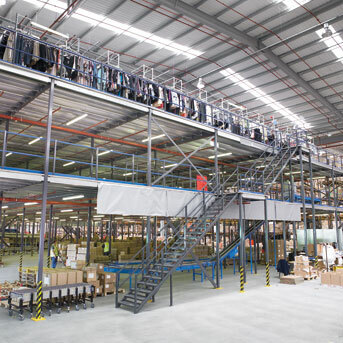 Mezzanine floors are not only for the industrial sector, they provide an excellent increase in space across all sectors like retail and the office environments. In the case of designer shops or offices can include stunning glass and chrome balustrades. There are a number of different partitioning systems available, all with many different uses, from wire mesh partitioning systems, single steel partitioning, double skin steel partitioning, server and data centre mesh partitioning. If you need to protect hazardous, high value, bonded goods or to segregate electrical equipment, then mesh partitioning is the most cost effective storage system available. Single and double skin systems enable you to enclose working areas and even create clean room environments. All of our partitioning systems are designed, manufactured and installed to the highest quality in the World. Partitioning systems can include single, double or sliding doors, windows, locks for security and even work together to create safe, secure and clean working environments.